To understand and deal better with your ego, just be a witness. Not the doer. The ego is all about doing. Being the witness is about non-doing, simply seeing. In fact, as I have seen it happen in my Life, all of Life’s experiences are to humble you, to teach you to be a good witness. To realize that in any case you are not causing anything – neither success, nor failure. And with each new experience, your ego gets peeled away. And you start relating to your inner core, your soul, more and more. Imagine your lifetime to be like a pencil. 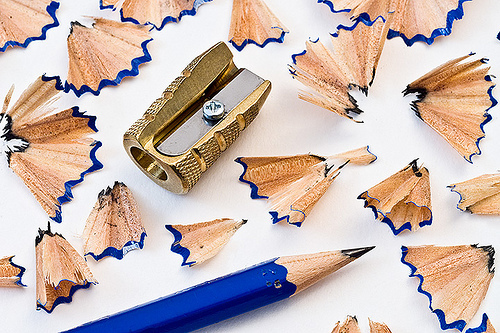 As you sharpen the pencil, its shavings fall to the ground and expose the lead within. With your lifetime too, the same thing is happening. With each experience, a part of your ego has been shaved off and you are closer to your real Self. Over time, there’s only a non-doing, no ego Self of you that is left. And that’s the point when you truly realize what a great teacher Life is! So, don’t fuss or obsess over your ego. Don’t be stumped by it. Don’t be controlled by it. Don’t attempt to drop it either. Just sit back and watch Life happen to you. As if you are a third party, a mere witness. When you are in this state, you can see through this whole game called Life. You will realize that you were never in control, you are not in control, that you cannot control anything in your Life! You will then enjoy yourself merely being a witness, without engaging with your doing self – your ego! You will then be bliss!